The California Quail is a handsome, round soccer ball of a bird with a rich gray breast, intricately scaled underparts, and a curious, forward-drooping head plume. 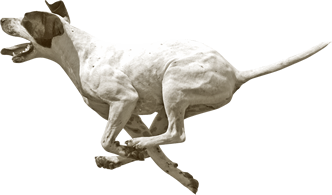 Its stiffly accented Chi-ca-go call is a common sound of the chaparral and other brushy areas of California and the Northwest. Often seen scratching at the ground in large groups or dashing forward on blurred legs, California Quail are common but unobtrusive. 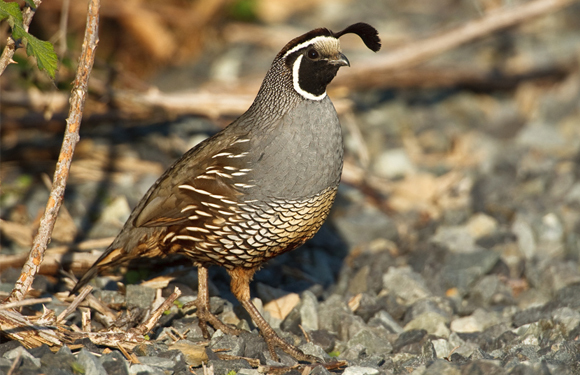 California Quail are plump, short-necked game birds with a small head and bill. They fly on short, very broad wings. The tail is fairly long and square. Both sexes have a comma-shaped topknot of feathers projecting forward from the forehead, longer in males than females. Adult males are rich gray and brown, with a black face outlined with bold white stripes. Females are a plainer brown and lack the facial markings. Both sexes have a pattern of white, creamy, and chestnut scales on the belly. Young birds look like females but have a shorter topknot. California Quail spend most of their time on the ground, walking and scratching in search of food. In morning and evening they forage beneath shrubs or on open ground near cover. They usually travel in coveys. Their flight is explosive but lasts just long enough to reach cover.